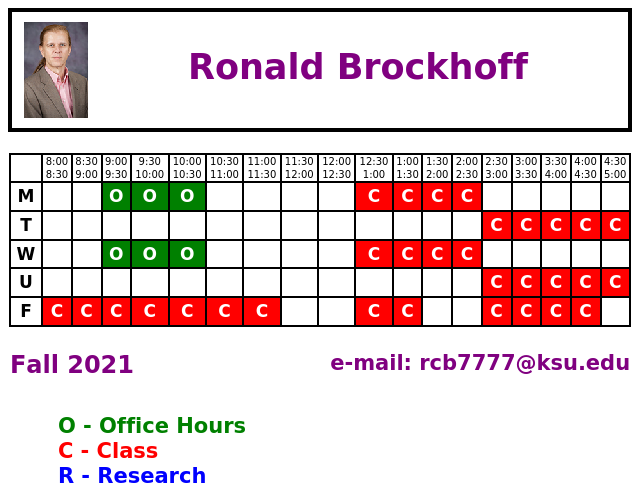 Professor Ronald Brockhoff received a B.S. Degree in Nuclear Engineering from Kansas State University in 1992 and subsequently received a M.S. Degree in Nuclear Engineering in 1994. He also worked in the X6 Theoretical Physics Division at Los Alamos National Laboratory from 1993 to 1997. He held a Q-Level Security Clearance during this period and published a series of papers related to the use of MCNP for radiation transport and medical imaging analysis. In 1998 Dr. Brockhoff worked briefly in the CIS department at Topeka Technical College before taking a new position as a software engineer at Networks Plus in Manhattan, KS. Dr. Brockhoff continued in this capacity before forming his own software development company called Stasyx, Inc. in 2003. Dr. Brockhoff has acted as the president of this corporation since its inception and is proficient in many programming languages including VB.Net, C#, C++, Java, and Xcode. During Dr. Brockhoff’s tenure at Stasyx he returned to Kansas State University and completed a Ph.D. in Nuclear Engineering in 2004. Recently Dr. Brockhoff stepped back from his daily activities at Stasyx to join the faculty at Kansas State University. Dr. Brockhoff published a series of papers in the early 1990s. These publications included several journal articles in Nuclear Science and Engineering. These publications focused on the use of MCNP for radiation transport calculations as well as its use for medical imaging analysis. Dr. Brockhoff authored and/or co-authored several journal articles in the early 1990s. His research focused on the use of the MCNP transport code maintained by the Los Alamos National Laboratory. He focused on the use of radiation transport calculations to develop simplified Skyshine and Albedo approximations. He also developed a series of models to reconstitute phantoms based on actual patient profiles and use them to analyze different potential CT scanner designs. Dr. Brockhoff obtained his B.S., M.S., and Ph.D. at Kansas State University and recently returned to Kansas State University in hopes of making a positive impact on current and future students in the department.